The Australian Shuffle is not a dance step, it’s a card deal. In fact it’s one of the best deals in town. We suggest you take the step of learning it. Better known as the Down Under deal, it describes a situation where you take a packet of cards of any size, and alternately deal a card (Down) onto the table, and then tuck a card (Under)neath the remaining cards, continuing in this way until only one card remains in your hand. Clearly, for a fixed-size packet, the card that remains is determined by its initial position in the packet. The following tricks show how this principle can be exploited by some subtle card handling and mental arithmetic done on the fly. We start with a trick found in Martin Gardner’s book The Unexpected Hanging and Other Mathematical Diversions (pages 152 and 155–6), where the author reveals that he learnt the basic idea from Mel Stover. He credits John Scarne with the presentation below, mentions a Bob Hummer version from 1939, and describes several variations on the theme due to Sam Schwartz and others. Hand out the deck for shuffling. Take it back, and shuffle further. Ask a volunteer to call out a random number bigger than 10. Count out that many cards from the deck and hand them to the volunteer, who then does the Down Under deal, under your direction, until just one card remains. You correctly name that card. You must know the top card of the deck at the outset. This is easy enough to accomplish: for instance, at some point during your shuffling, after the deck has been genuinely randomized by the volunteer, peek at the bottom card and then shuffle it to the top. You can do additional shuffling while retaining that key card at the top. Next, you need to find twice the difference between the number called out and the highest power of 2 which is strictly less than it. For instance, if 14 is called out, then compute 2 x (14-8) = 12. Now count out that many (12 in this case) cards casually, dealing into a pile, and thus reversing them. Gather the cards while feigning poor memory, saying, “How many did you say? Oh, fourteen,” and scoop two extra cards off the deck and place them beneath the cards in your hard. Thus you now have the card whose identity is known in position 12 in a packet of 14 cards. If a power of 2, e.g., 16, is called out, then since 2 x (16-8) = 16, simply count out that many cards into a pile, thus reversing them. In either case, hand this packet to the volunteer, and carefully direct the Down Under dealing. The last card is guaranteed to be the original top card. Everything becomes clearer if we convert to base 2. First suppose the called out number is abc…e in base 2, and is not itself a power of 2. The highest power of 2 less than this is 100…0, which upon subtraction from 1abc…e yields abc…e. Twice that is abc…e0. You count out that number into a pile, thus reversing their order, and finally scoop the remaining cards underneath. This buries the original top card abc…e0 deep in a pile of size 1abc…e. If, on the other hand, a power of two, say 1000…0, is called out, then the dealing places the original top card at the bottom of the pile. The reader can now check that in both cases, the Down Under deal results in the known card being the last card remaining in the hand. John Scarne also turned the basic idea of the last trick into a brilliant effect where the tables are turned: the volunteer handles the cards throughout and finds a card that you pick! The deck is freely shuffled. You announce that you are merely going to think of a card, and see if the volunteer can locate it. Have a random number greater than 20 called out, and ask the volunteer to deal that many cards face up into a pile, indicating that you are going to see if your mentally chosen card is among those. At the conclusion of the deal, claim that you did indeed see your card among those counted out, and have the remainder of the cards put away. As an apparant afterthought, write the name of your card on a piece of paper, and have that folded and put to one side. The cards dealt are picked up and placed face-down again, and the volunteer does the Down Under deal until just one card remains. You remark, “If that’s the card I thought of, you’re a better magician than I.” It does indeed turn out to be your card, as the piece of paper confirms! What really happens here is that you use the called-out number to compute the position of the card which will “rise to the top” when the volunteer does the Down Under deal; that’s the one you (belatedly) “think of,” and write on the paper. To achieve this end, find twice the difference between the number called out and the highest power of two which is strictly less than it. For instance, if 25 is called out, then compute 2 x (25-16) = 18. The 18th card dealt face-up, out of 25, is the one you claim to have thought of in the first place. The cards are then turned face-down again, and the Down Under deal takes care of the rest. If 32 were called out, then since 2 x (32-16) = 32, the conspicuous last card dealt would be your card. This is too risky, as the volunteer or another audience member may remember later that this was the last card dealt. In such cases, suggest that the packet be shuffled some more, and then you do whatever you have to, to get a peek at the new bottom card before the dealing begins. When performing any such trick, one soon discovers that if the called-out number is too big, the dealing becomes tedious. Smaller packets work well in any case, say of 10 to 20 cards. A quick examination of the numbers reveals something else of interest, as we shall shortly see, and points to the desirability of a less “top down” card management style. We suggest a new approach to both the mental arithmetic involved and the (false) counting, by presenting such a variation of the original trick. We leave it to the interested reader to make the appropriate adjustments to Scarne’s ingenious role reversal treatment. A volunteer calls out a random number, say between 5 and 20. Count out that many cards from a shuffled (!) deck and hand them to the volunteer, who then does the Down Under deal until one card remains. You correctly name that card. The first row lists the size of the packet which will be used, which is the called-out number. The second row lists the positions in the packet, starting from the top, to which the original top card must be moved, computed as in the earlier tricks. The third row lists same these positions, counting from the bottom of the packet. If these are added to the corresponding numbers in the first row, it becomes clear how to find them with less effort in the first place. Simply subtract the packet size from 9, or 17 or 33, whichever is closer, so as to get the smallest possible positive result. E.g., suppose, that 14 is called out, so that we wish to get the top card of the deck to position 12 from the top. This is the same as getting it to position 3 from the bottom. Certainly it is easier to subtract 14 from 17 to get 3 than it is to do the 2 x (14-8) = 12 computation suggested earlier. Even better, there is a more natural way to do the false count: simply count out 3 cards casually from hand to hand (this does not reverse them) and drop them, as a unit, in a pile on the table, and then count out the remainder (“Four, five, six, …, fourteen”) and drop those on top of the first pile. The two actions are identical, most audiences will attach no significance to the break in the count. You can even take more breaks, if you wish to muddy the waters further. For instance, you could peel off small groups of cards and drop them on the table casually, as long as the first group contains exactly 3 cards. Thanks to Joe M. Turner of the Georgia Magic Club (I.B.M. Ring 9) for suggesting this false count variation. You now have the card whose identity you know in position 3 from the bottom, or 12 from the top, in a packet of 14 cards. As before, hand this packet to the volunteer, and carefully direct the Down Under dealing. The last card is guaranteed to be the original top card. Note that if 17 is called out, then we subtract it from 33, not from itself! The moral? Sometimes, when looking up from the bottom of a well, you can see better than you can peering into it from the top; once your eyes adjust. Amateur magician Oscar Weigle invented this surprising effect in 1949. Assemble a deck of 20 playing cards, 10 red and 10 black, in strictly alternating colors. Hold this deck under a table. Now turn over the top two cards as one, place them on top, and cut the deck. Repeat this procedure as many times as you like — turn two, cut, turn two, cut. When you’ve finished, the deck will contain an unknown number of reversed cards, distributed randomly. Now, still holding the deck under the table, shift the top card to the bottom, then turn over the next card and place it on the table. Do this repeatedly — shift a card to the bottom, then reverse the next card and put it on the table — continuing until you’ve put 10 cards on the table. Surprisingly, these cards are sorted by color — the face-up cards are of one color, and the face-down ones are of the other. You’re still holding 10 cards under the table. Divide these into two stacks and weave them together under the table randomly. Do this as many times as you like — divide the 10 cards into two groups and merge them together however you like, so long as no card is turned upside down. Turn over the packet and shuffle it in the same way a few more times. Give it a final cut if you like. Now deal these cards out as before: Shift the top card to the bottom, reverse the next card and put it on the table. Like the first group, this one will sort itself by color, with one color face up and the other face down. They seem harmless enough, 52 thin slices of laminated cardboard with colorful designs printed on their sides. Yet, as another illustration of the mantra that complexity begins from the most simple systems, the number of variations that these 52 cards can produce is virtually endless. The richness of most playing card games owes itself to this fact. The number of possible permutations of 52 cards is 52!. I think the exclamation mark was chosen as the symbol for the factorial operator to highlight the fact that this function produces surprisingly large numbers in a very short time. If you have an old school pocket calculator, the kind that maxes out at 99,999,999, an attempt to calculate the factorial of any number greater than 11 results only in the none too helpful value of “Error”. So if 12! will break a typical calculator, how large is 52!? This number is beyond astronomically large. I say beyond astronomically large because most numbers that we already consider to be astronomically large are mere infinitesmal fractions of this number. So, just how large is it? Let’s try to wrap our puny human brains around the magnitude of this number with a fun little theoretical exercise. Start a timer that will count down the number of seconds from 52! to 0. We’re going to see how much fun we can have before the timer counts down all the way. Start by picking your favorite spot on the equator. You’re going to walk around the world along the equator, but take a very leisurely pace of one step every billion years. The equatorial circumference of the Earth is 40,075,017 meters.Make sure to pack a deck of playing cards, so you can get in a few trillion hands of solitaire between steps. After you complete your round the world trip, remove one drop of water from the Pacific Ocean. Now do the same thing again: walk around the world at one billion years per step, removing one drop of water from the Pacific Ocean each time you circle the globe. The Pacific Ocean contains 707.6 million cubic kilometers of water.Continue until the ocean is empty. When it is, take one sheet of paper and place it flat on the ground. Now, fill the ocean back up and start the entire process all over again, adding a sheet of paper to the stack each time you’ve emptied the ocean. Do this until the stack of paper reaches from the Earth to the Sun. Take a glance at the timer, you will see that the three left-most digits haven’t even changed. You still have 8.063e67 more seconds to go. 1 Astronomical Unit, the distance from the Earth to the Sun, is defined as 149,597,870.691 kilometers.So, take the stack of papers down and do it all over again. One thousand times more. Unfortunately, that still won’t do it. There are still more than 5.385e67 seconds remaining. You’re just about a third of the way done. To pass the remaining time, start shuffling your deck of cards. Every billion years deal yourself a 5-card poker hand. Each time you get a royal flush, buy yourself a lottery ticket. A royal flush occurs in one out of every 649,740 hands.If that ticket wins the jackpot, throw a grain of sand into the Grand Canyon. Keep going and when you’ve filled up the canyon with sand, remove one ounce of rock from Mt. Everest. Now empty the canyon and start all over again. When you’ve levelled Mt. Everest, look at the timer, you still have 5.364e67 seconds remaining. Mt. Everest weighs about 357 trillion pounds.You barely made a dent. If you were to repeat this 255 times, you would still be looking at 3.024e64 seconds. The timer would finally reach zero sometime during your 256th attempt. Exercise for the reader: at what point exactly would the timer reach zero? Of course, in reality none of this could ever happen. Sorry to break it to you. The truth is, the Pacific Ocean will boil off as the Sun becomes a red giant before you could even take your fifth step in your first trek around the world. Somewhat more of an obstacle, however, is the fact that all the stars in the universe will eventually burn out leaving space a dark, ever-expanding void inhabited by a few scattered elementary particles drifting a tiny fraction of a degree above absolute zero. The exact details are still a bit fuzzy, but according to some reckonings of The Reckoning, all this could happen before you would’ve had a chance to reduce the vast Pacific by the amount of a few backyard swimming pools. Please be advised that rounding and measurement error combined are many orders of magnitude greater than the current age of the universe, 4.323e17 seconds. 52! is approximately 8.0658e67. For an exact representation, view a factorial table or try a “new-school” calculator, one that understands long integers. A billion years currently equals 3.155692608e16 seconds; however, the addition of leap seconds due to the deceleration of Earth’s orbit introduces some variation. The equatorial circumference of the Earth is 40,075,017 meters, according to WGS84. One trip around the globe will require a bit more than 1.264e24 seconds, assuming 1 meter per step, which is actually quite a stretch for most people. This is almost 3 million times the current age of the universe, and we still have 2 levels of recursion to go (ocean, stack of papers). There are 20 drops of water per milliliter, and the Pacific Ocean contains 707.6 million cubic kilometers of water, which equals about 1.4152e25 drops. 1 Astronomical Unit, the distance from the Earth to the Sun, is defined as 149,597,870.691 kilometers. 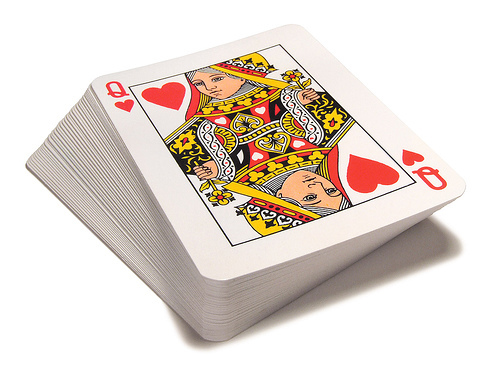 A royal flush occurs in one out of every 649,740 hands. The odds of winning a lotto jackpot after matching 6 numbers chosen without replacement from the range 1 to 59 are 1 in 45,057,474. The Grand Canyon has an estimated volume of 40 billion cubic meters. 1 grain of sand occupies approximately 1 cubic milimeter. Thus, the Grand Canyon could hold roughly 4e19 grains of sand. This article estimates that Mt. Everest weighs about 357 trillion pounds. Here you can read all about The End.